Follow the Loch Laggan road out from Bonar Bridge for about 6 miles from Bonar Bridge until you come to the Loch by the roadside on your left. You cannot miss the Loch, its waters are yards from the main road, with ample parking on the grass next to the Loch. The association’s boats are moored next to the parking. Fishing is from either bank or boat. 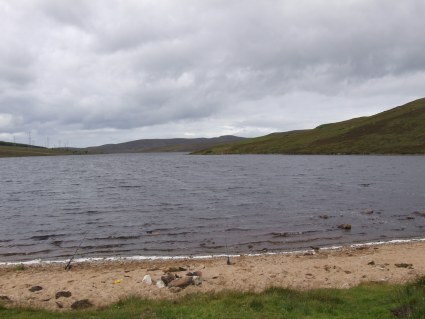 The Loch is 1 mile long by 350 yards wide and, toward its North East corner; it reaches a depth of over 30 feet. The Loch population of well-marked, hard-fighting wild brown trout and a small number of salmon and sea trout enter the Loch each autumn. Good results are had over most parts of the Loch. Try all the usual hill Loch flies and, in a good wave, a large wake inducing fly fished on the bob can bring fish to the surface. Loch Buidhe lies 530 feet above sea-level and sudden squalls can develop from nowhere. Great care is needed when fishing from a boat. A drogue is recommended. Although the road runs along the entire length of the South side of the Loch traffic is extremely light and you are likely to fish undisturbed. Ospreys are occasionally seen.